Congratulations! If you’re reading this, then the hard part is over. She said yes. But before you start envisioning a future together, there’s still a hurdle you must cross – the first date. Nerve-wracking, yet full of possibilities, first dates are a little like playing the lottery. You gotta be in it to win it, but with these tips from us, you could very well tilt the odds in your favour. Take Charge. Don’t leave the prep work to the girl. If you truly want to meet her, then make the effort to plan something special for the both of you. Asking the girl to decide where to go or where to eat signals your interest, or lack thereof, in the date. But don’t go overboard trying to impress her either. You don’t want to give the impression that you’re “buying” her heart, especially if it looks as if you’ve spent a lot of money on that date. Whether you choose to bring her to an upscale restaurant or somewhere more adventurous, like a Mexican bar, the key is to pick a place where you can get to know each other better through conversation. Be Fun. Dinner dates are tried and tested but really, the sky’s the limit when it comes to first date ideas. If the both of you happen to have the entire day free, why not make the most of it by having an unconventional first date? Plan an outing to Universal Studios Singapore and challenge each other on the thrill rides. 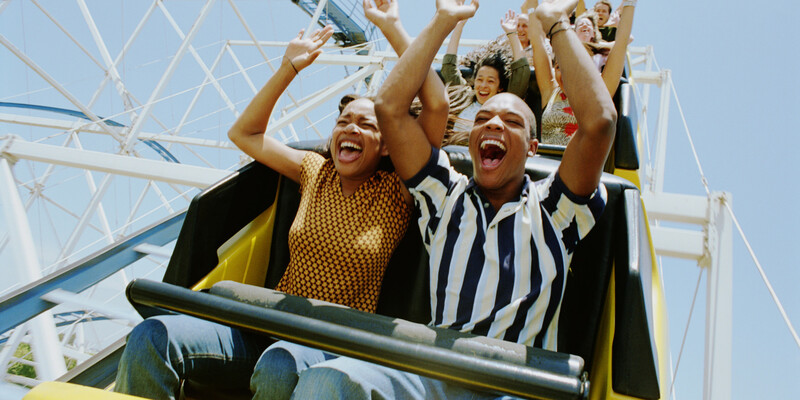 Research has shown that riding rollercoasters causes the body to release a hormone that mimics the effect of falling in love. Bonus points if you man up and offer her your arm to grab on during the ride. Flower Power. You’ve got the perfect date all planned out; now take the next step by surprising her with flowers when you meet. You don’t have to present her with a bouquet of 99 roses, but offering her a small bouquet of flowers or even just a single rose is romantic and thoughtful. Even if she doesn’t like flowers, she will still appreciate that you made the effort to be sweet. Compliment Her. Us girls will never admit this, but our first date prep typically starts the night before when we lay out 20 different outfits, try them all, and then call our best friend to complain about having nothing to wear. After all that, the least you can do is to show that you’ve noticed the effort your date put into dressing up and offer her a compliment or two. It doesn’t have to be complicated. A simple and sincere “You look beautiful tonight” trumps any flowery flattery and can set a romantic tone for the rest of the date. Put Your Phone Away. One of the most annoying things a guy can do on a date is to check his phone every time it beeps. Replying to texts or checking your emails while your date is speaking is not only rude but it also distracts the both of you from the conversation at hand. In fact, research from the Journal of Social and Personal Relationships found that having your phone on the table during a date could affect your ability to bond with her. After all, how do you expect to have a meaningful conversation if you’re checking your phone every few minutes? Apart from allowing the both of you to focus on each other, putting your phone away also signals to your date that she’s your number one priority – definitely the way to go if you’re hoping for date #2. Shut Up. Believe it or not, no woman is going to sit through two hours of you boasting about your life, your job or that time you went skydiving with your buddies. No matter how fascinating you think they may sound. There’s a fine line between making a good impression and sounding self-absorbed, so tread carefully when you’re trying to impress her. A first date is a chance to get to know each other better, so ideally both of you should have equal opportunities to talk about yourselves. Don’t just prattle on about your achievements; ask her about her hobbies and her dreams. Find out what she is passionate about. It may seem awkward at first, asking such questions, but going beyond superficial questions is how you forge a lasting connection. For a handy guide on what questions to ask, check out psychologist Arthur Aron’s 36 questions that can make two people fall in love. End Strong. The date doesn’t end the minute you send her home! If the both of you felt a spark during the date, why not lean in for a sweet goodnight kiss on her cheek? If it’s still too early for that, just tell her how much you enjoyed her company. If she feels the same way, she will let you know too, and the both of you can make plans for a second date! Forget those rules about waiting three days to tell her how you feel. If you truly wish to see her again, don’t leave her second guessing your interest in her. You’re a man, so act like one. A first date is always a gamble. Sometimes you get lucky and end up with the girl of your dreams, but sometimes you and your date are just not meant to be. Understanding this will allow you to keep an open mind during the date and relax. Ultimately, first dates are not rocket science. Just be yourself and get to know her better.